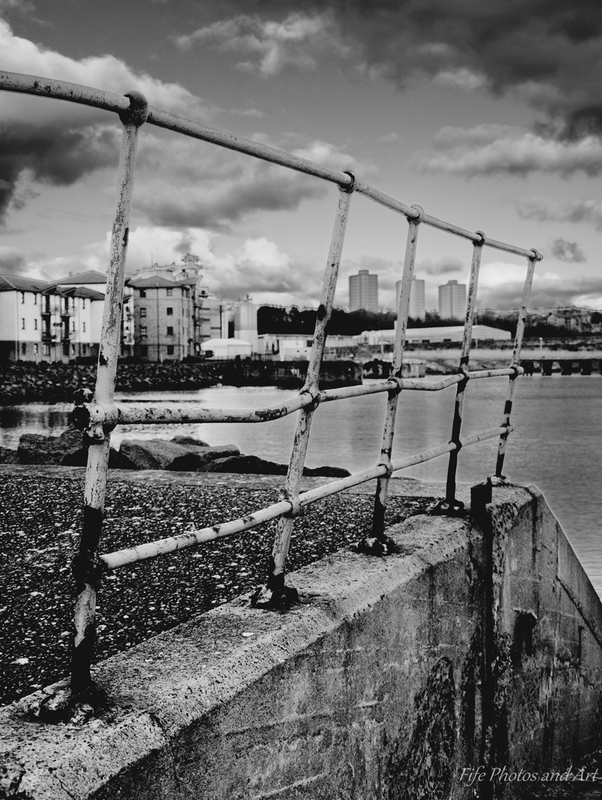 This entry was posted in Architecture, Fine Art Photography and tagged black & white photography, harbours, Kirkcaldy, landscape photography, photography, Scotland. Bookmark the permalink. Love how the iron railing in the second photo seems to frame individual scenes within the whole picture. Thanks Jean 🙂 The railing certainly helped create a much more interesting photo. Love me some good B&W. Great shots, Andy!! Thanks Julie 🙂 Glad you like the photos. I really like the dynamic lines in the first photo, the way the eye is led along the water and is then disrupted by that rusty fencing. Great framing in the second shot too. Thanks Laura 🙂 The fence certainly makes the two photographs far more interesting, without it the shots would have been quite flat and fairly boring. What a great image, Andy! That banged-up fence leads the eye to what lies beyond. Thanks Lori 🙂 I was pleased at how well the photos worked, the harbour itself is very UNphotogenic! Nice B&W conversions… great detail! I think every waterway in the UK has flats like that alongside it now! I think you’re probably right Gilly, it’s such a shame. I’m all for building new housing, but not at the expense of ruining some fairly picturesque localities. On the other side of the flats are some of the oldest buildings in Kirkcaldy, built in the 1600s, which would have looked fantastic overlooking the harbour. Love the way you’ve practically fenced off the new builds with the rusty old railings 🙂 Makes a great storytelling composition! Thanks Sarah 🙂 The railings certainly helped the photographs, the photos would be quite boring without them. 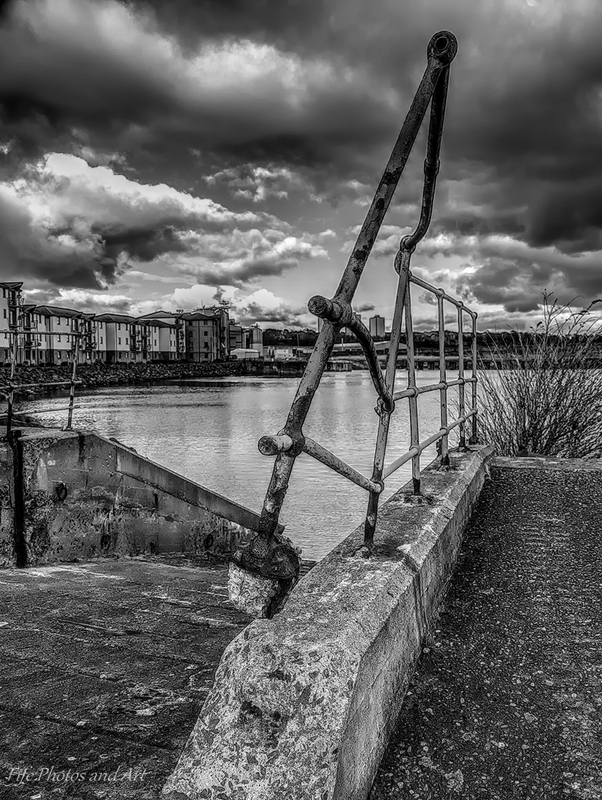 Excellent black and white effect – it just so adds to the atmosphere! Good photos. It makes me want to see it in person. Good grief these are fabulous! Thank you Osyth 🙂 Glad you like them! Thanks Sherrill 🙂 You’re right about black & white often adds emotion and atmosphere to a photo. I had remarked to Gilly that Durham is one of the best preserved city centres I know. There’s a hotel and a small shopping complex but most of the riverbank is quite natural. Thanks Sophia 🙂 I totally agree with you about the older architecture being far more interesting, and far more in keeping with the rest of the area around the harbour! I just read a Val McDermid mystery set around Kirkaldy; nice to see what it looks like. Love the B&W. You made these images your own, Andy, with great composition, contrast, texture and detail. I absolutely love both of these Andy – your compositions are spot on and the B&W really gives them a nostalgic feel. Well done indeed! Thank you very much Tina, glad you like them 🙂 You’re right about the B&W, the colour versions were quite boring in comparison.